I love this quote for a number of reasons. I first saw it the other day when I was driving around town, spray painted in black on a white background – striking, simple and poignant. The object that had been painted white? A street-side concrete garbage container. The garbage container was located outside a high school. Youth activism in today’s text message world. Perfect. Who is the author of this quote? A quick Google search attributed it to both Mother Teresa and Gandhi. I didn’t feel the need to search further, to suss-out just who was the definitive author. Either is fine by me. What was your reaction when you first read this quote? What do Kim Kardashian, Tom Cruise, and Mother Teresa have in common? But famous for what? What classifies someone as famous? According to the Oxford Dictionary, ‘famous’ is defined as: “known about by many people” while ‘fame’ is defined as: “the condition of being known or talked about by many people, esp. on account of notable achievements”. Let’s start with Kim Kardashian. What in the h-e-double-toothpicks is so special about her? Where did she come from and how in the heck did she get to be so known about by many people? What has she contributed to society? What are her notable achievements? Tom Cruise – this one is a bit easier. Jockey-shorts-dancing ’80’s teen heart-throb turned action-star turned couch-jumper turned questionable. He certainly mastered the talked about by many people portion of fame and now with his current situation the conversation continues. 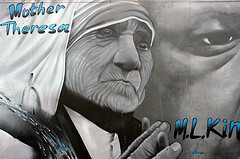 Mother Teresa would appear to epitomize the Oxford definitions of both ‘famous’ and ‘fame’. Her name known by all, both pre and posthumously, she embodied goodness and faith in humanity. Her notable achievements are innumerable. Her effect on society continues beyond her life. A legacy of hope, love, compassion and fortitude. So, the next time someone asks: Do you want to be famous? Before answering, define what fame means to you. For me, if famous means that I have attained my fame based on achievements that leave a legacy for the benefit of mankind; that I have contributed to society in a positive and lasting way; and that I am known about by many people because of those acts, then the answer is a resounding ‘Yes!’. Do you want to be famous? What does fame mean for you? Writer for hire. Toronto Freelance Writer: Success Stories, White Papers, Copywriting, Blogging. Dream of living off the grid? Now it’s easy! *THIS* is Awesome! Literally. You HAVE To See This…. Not As Recent, But Not To Miss! Is Striving For Perfection Good or Bad? Should Preschoolers Rule the World? Should We Still Teach Our Boys To Be Gentlemen? What Is The Price Of Change?